Recent sweeping gains by the pro-Assad alliance in Aleppo signal the rise of an emboldened Iranian-led radical Shi'ite axis. The more this axis gains strength, territory, weapons, and influence, the more likely it is to threaten regional and global security. Ideologues in Iran have formulated a Shi'ite jihadist vision which holds that the Iranian Islamic revolution must take control of the entire Muslim world. 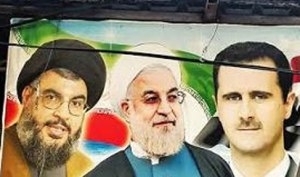 Losing the Assad regime to Sunni rebels, many of them backed by Tehran's Gulf Arab state archenemies, would have represented a major setback to Iran's agenda. This same ideological agenda also calls for the eventual annihilation of Israel, the toppling of Sunni governments, and intimidating the West into complying with Iran's schemes. Supreme Leader Ayatollah Khamenei and Tehran's military elites, in the form of the Islamic Republican Guards Corps (IRGC), use the current regional chaos to promote these goals. In Syria, Iran has mobilized tens of thousands of Shi'ite militia fighters from all over the Middle East, as well as those from Hizballah in Lebanon, and sent them to do battle with Sunni rebel organizations to help save the Assad regime. As the Shi'ite axis wages a sectarian war against Sunnis moderate groups and jihadists, it mobilizes and arms its proxies, and moves military assets into Syria, gaining a growing influence that can be used for bellicose purposes in the not too distant future. The conquest of east Aleppo is a victory for the wider, transnational Iranian-led alliance, of which the Damascus regime is but one component. The Assad regime is composed and led by Syria's minority Alawite population, which makes up just 11 percent of Syrians (Alawites are seen as an offshoot of Shia Islam). A look at the order of battle assembled in Aleppo reveals that the war in Syria is not a civil conflict by any measure. In addition to Assad regime forces sent to fight Sunni rebels, such as the Fourth Division, Syrian army special forces, and paramilitary units, there is also the Iranian-backed Hizballah, which has transformed itself into a regional Shi'ite ground army, deployed across Syria and Lebanon. These are joined by Shi'ite Iraqi Kataib Hizballah militia, Afghan Shi'ite militia groups, and Iranian military personnel on the ground in Syria, all of whom receive the assistance of massive Russian air power. The large scale, indiscriminate airstrikes and shelling in places like Aleppo resulted in mass slaughter and ethnic cleansing of many Sunni civilians, producing the largest humanitarian catastrophe and refugee crisis in the 21st century. Such extreme war crimes will be sure to produce a new generation of radical recruits for ISIS and al-Qaida. The IRGC's Quds Force, under the command of Qassem Suleimani, orchestrates the entire ground war effort. Suleimani is very close to the Iranian supreme leader. The Quds Force uses Syria as a transit zone to traffic advanced weapons from Iranian and Syrian arms factories to the Hizballah storehouses that pepper neighboring Lebanon. Hizballah has amassed one of the largest surface to surface rocket and missile arsenal in the world, composed of over 100,000 projectiles, all of which are pointed at Israeli cities. According to international media reports, Israel recently launched two strikes in the one week, targeting attempts to smuggle game-changing weapons to Lebanon. Syrian dictator Basher Assad owes his survival to Iran and Hizballah, and their military presence in Syria should continue and expand further. Assad regime and Hizballah representatives boast of this fact in recent statements highlighted by the Middle East Media Research Institute (MEMRI). "The power-balances will change not only in Syria but in the entire region," said Hizballah Executive Council Chairman Hashem Safi Al-Din. "Syria's steadfastness, and the support from its allies, have shifted the regional and international balance [of power], said Assad political adviser Bouthaina Sha'aban. "The recent developments in the international arena are bringing the countries of the region face to face with a new world. If it takes western Syria with Russian air support, the Shi'ite axis victors will likely turn their sights on seizing southern Syria, near the Israeli border. To accomplish that, they will need to do battle with an array of Sunni rebels that now control that area (groups that include ISIS-affiliates). If successful, the axis could be tempted to build bases of attack throughout Syria against Israel, a development that would certainly trigger Israeli defensive action, as has reportedly occurred in the past. The same pattern repeats itself in Iraq, where Iran-backed militias are moving in on Mosul, and could later be used to threaten Iraq's Sunnis, and in Yemen, where Iranian-armed Houthi rebels control large swaths of the country, and are currently at war with a Saudi-led military coalition. The Houthis also threaten international oil shipping lanes and have fired on the U.S. Navy using Iranian-smuggled missiles. In this way, the fundamentalist Iranian coalition gains a growing foothold. Iran's ballistic missile program, which is developing long-range strike capabilities that could place Europe in range, and its temporarily dormant nuclear program, represents investments that would make the Shi'ite axis more powerful than any Sunni Islamist camp. Defense officials in Israel and in pragmatic Sunni states will watch for the danger that Iran will use its presence, proxies, and bases in Syria and Iraq to wage a Shi'ite jihad that extends well beyond the battlegrounds there. The Iranian coalition can also lure armed Sunni groups into its orbit as well, as it has done in the past with the Palestinian Hamas terrorist regime in Gaza. While the Israeli defense establishment has no desire to be dragged into Syria's conflict, Jerusalem has indicated that it would act to remove any Iranian-Hizballah base it detects in Syria that is designed to launch attacks on Israel, and would not tolerate the trafficking of advanced weapons to Hizballah. Few events illustrate more clearly how an ascendant Shi'ite jihadist axis is redrawing the map of the region than a recent military parade held by Hizballah in the western Syrian town of Al-Qusayr, which it conquered from the rebels in 2013. According to an assessment by the Tel Aviv-based Meir Amit Intelligence and Terrorism Information Center, that parade featured Soviet-made tanks, American armored personnel carriers, artillery guns, anti-aircraft guns, and powerful truck-mounted rocket launchers with an estimated range of between 90 to 180 kilometers. "It is clear that state-owned capabilities, some of them advanced, were delivered to Hizballah, which is a terrorist organization," the Intelligence and Terrorism Information Center said in its report. Hizballah, like the Assad regime and armed groups in Iraq and Yemen, is a component of an international axis whose battles against ISIS have managed to dupe some decision makers into believing that they are stabilizing forces. In actuality, the Shi'ite jihadists are as radical as their Sunni jihadist counterparts – albeit more tactically prudent – and are far better armed and better organized.